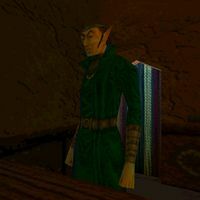 Gerrick is an Altmer trader in Stros M'Kai who owns the town's general store, Gerrick's Goods. He has a pet parrot named Orsone that likes to rhyme and interrupt his conversations. His store sells the items on display, except for candles: aloe, a compass, canah feathers, a shovel, and torches. Gerrick pays Rollo to bring up shipments from the harbor, and like others he doesn't think highly of him. Apart from Gerrick's usual items, his shipments have included Valenwood wine and malachite, though he hasn't carried the latter since the alchemist Vromish died. Iszara came by his store looking for malachite before she disappeared. Gerrick believes she had connections to the Restless League and went to the Smuggler's Den afterward to find some. He is one of four people who you may hear about the Smuggler's Den from, the others being Mariah, Prnell, and Siona. Contact the League: Find the Restless League and discover Iszara's plan. The topics "Iszara" and "League" are supposed to disappear after the quest Rescue Iszara, but the variable that implements this is never set. The only requirement for the topic "Rollo" to appear is that you speak to Rollo, but it's clearly a continuation of "Business", which does not need to be asked first. "Hello, shopkeeper. My name is Cyrus." "Pleased to meet you, my good fellow. Gerrick, your humble servant." "Cyrus! A pleasure to see you again!" "I'd like to make a purchase." "Splendid! What do you need?" "I'm afraid your funds are a little short." "A pleasure doing business with you, Cyrus!" "The best quality, I assure you!" "I'll have to think about it." "I'm sure you'll change your mind." "The shovel over there -- how much?" "A sturdy shovel, just the thing for the intrepid treasure hunter! Guaranteed not to break, scratch, or dent! A bargain at only 30 gold." "What's aloe going for today?" "Aloe leaves from southern Hammerfell, the best, fresh every week. Excellent for soothing those aches and pains. And just 15 gold per bunch." "How much for a torch?" "A classic design, functional and long-lasting. For you, Cyrus, 20 each." "That looks like a decent compass." "The one item no one should be without. Never lose your way again! For the small investment of 50 gold, peace of mind for a lifetime." "Ah yes, from the exotic canah bird--a favorite of mine for they are bred on Summerset Isle. Bred for their beauty I might add. They make an excellent gift for 10 gold." Orsone: "I'm a pretty bird!" "The beauty of the canah bird doth intoxicate, I admit. 10 gold apiece." "I wonder if you know my sister, Iszara." "... A lovely name, by the way ... I believe she may have been mixed up with those League pirates, am I right?" "What do you know about the Restless League?" "A collection of the worst scum from the sewers of Stros M'Kai! Pirates who'd cut your throat as soon as look at you!" Orsone: "I know your sister's name." "Ignore Orsone, good Cyrus, he's a half-wit. What were we talking about?" "If it's not pirates stealing your cargo, it's Imperial taxes. I get by, though. "All the ships heading for the Iliac Bay pass through here, so I get first crack at their wares. As long as I can get that lazy Rollo to bring it up from the harbor." Orsone: ">>Squawk<<! Lazy Rollo fat fu--"
"I've heard tell of a magical flask hidden somewhere on the island. Do you know anything about it?" "The Flask of Lillandril, far-famed in song and legend! From my own homeland of Summerset Isle, you know. And you must have heard of the mysterious map--"
"I haven't been to Summerset Isle in years. Beautiful place, as I recall." "I should ask you for news then, Redguard. I last saw the Eternal Isle in my youth, long before you were born." Orsone: ">>Squaw ha ha ha<<!" "I'm older than I look! Beautiful, yes, but static and snobbish. A shopkeeper like me is lower than dirt back home. Here, I'm a respected pillar of the community!" "You know of a map to the flask?" "Oh yes! According to legend, the ship carrying the flask and its owners was shipwrecked on Stros M'Kai. "That was all back thousands of years ago, before the Redguards ever came to Hammerfell, you understand. "Perhaps a survivor hid the flask and made a map -- who knows? Trithik could tell you more, though." "He used to be quite the flask hound. Why, I must have sold him six shovels over the years!" "That's what I'm trying to find out. She's been missing for three months. What do you know about them?" "That bloodthirsty gang of villains! If your poor sister--"
"--was connected with them, I'm afraid to speculate on what might have happened." "They've been a plague on Stros M'Kai for years, although the cowards haven't dared show their faces since the Imperials arrived." Orsone: ">>Ssssquawkkk! Platepate parrot knowsmore! >>Squawk<<! Knowsmore!" "I'm afraid I may have made his acquaintance. Large, loutish, unwashed?" "Rollo, yes, a rather unlikely fellow, even if you don't mind the smell. But he'll tote a bale for a silver penny, and I can't even hire a mule for that." "Rollo works for you, then." "An exaggeration, to be honest. He's supposed to bring up my shipments from the harbor when they arrive -- a simple task, you would think -- but he's drunk or asleep half the time and doesn't hear the bell." Orsone: "Rollo >>squawk<< Rollo knowno >>squawwwwwk!<< Brainpan bone-o!" "The Empire crushed the Restless League?" "I assume so. They haven't been seen around Stros M'Kai for months. "The League pretended to be patriotic rebels after the Crowns' defeat, but a few encounters with Imperial warships quieted them down right quick." Gerrick worries that Iszara might have sought to find malachite through the Smuggler's Den. "Please, if you know anything more about Iszara... ."
"Well, she came into my shop some time ago. Looking for malachite -- don't stock it, of course, unusual request -- but she was very insistent." Orsone: ">>Squakka-ka!<< Sister plentymoney frightface!" "Iszara offered me a tidy sum for the malachite -- much more than it was worth. I said I could have some for her in three weeks, but she needed it right away. "I'm afraid she may have tried the Smuggler's Den, dear me. Not a place to walk into with a purse full of gold." "Did Iszara say why she needed malachite?" "I'm sorry, no. Not much call for it anymore, now that the Alchemist's shop is closed." Orsone: ">>Squawk<<! Old Vromish Crustfinger! >>Squawk<<!" Gerrick thinks that the Restless League is connected with the smugglers operating out of the Smuggler's Den beneath the Cartographer's shop. "Yes, under the Cartographer's shop. An open secret around town. "I'm sure those smugglers are connected with the Restless League -- selling Valenwood wine stolen from my own ships, at double the price since they have no competition!" "I can't prove any of it, of course." "Malachite is used in alchemy?" "I believe so. Old Vromish --"
"the alchemist, used to order a pound or two from time to time. "But he's been dead now these seven years, and the Mage's Guild gets their potions wholesale, so I haven't carried malachite since." "The Mage's Guild sells potions?" "Yes, they now have an official monopoly on magic of any kind. Archmage Voa's doing, took advantage of his access to the Prince, at the expense of us small businessmen! "Remains to be seen what the new Imperial policy will be. Governor Richton's too busy with his archeological hobby to bother with a small matter like economic policy!" "The Governor is an archaeology buff?" "He's crazy over anything Dwarven. The Dwarven Ruins are full of soldiers, looking for who knows what. "Richton better hope the Emperor never finds out how he's wasting his valuable troops!" "Where are these Dwarven Ruins?" "Down on the south end of the island. You won't get in, though. Richton's men have sealed the gates." Gerrick says that Rollo is supposed to fetch shipments from the harbor whenever he hears a bell rung by a fellow named Favis. Ringing the bell announces the arrival of a ship. "My old friend Favis rings the bell to signal the arrival of a ship, so the merchants know to come down to the harbor to trade. "Rollo is supposed to listen for it, but I've had such trouble with him. Ach, but you don't need to listen to an old elf complain!" "Thanks for the time, Gerrick." "-- supposedly showing where the flask is buried." This page was last modified on 15 August 2018, at 06:52.